Mike Cuellar was born on Saturday, May 8, 1937, in Santa Clara, Villa Clara, Cuba. Cuellar was 21 years old when he broke into the big leagues on April 18, 1959, with the Cincinnati Reds. His biographical data, year-by-year hitting stats, fielding stats, pitching stats (where applicable), career totals, uniform numbers, salary data and miscellaneous items-of-interest are presented by Baseball Almanac on this comprehensive Mike Cuellar baseball stats page. Did you know that Mike Cuellar was the first pitcher from the Baltimore Orioles to win a Cy Young Award ? During the 1969 season, Cuellar went 2311 (#2 in the A.L. ), struck out 182 batters (#5 in the A.L. ), and had a 2.38 ERA (#3 in the A.L.). 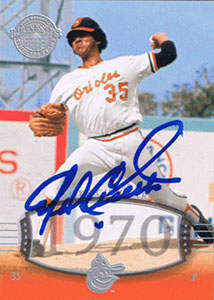 The 1969 Baltimore Orioles won a franchise-record 109 games and the very first American League East Division title (prior to the season, both the American League and National League had been divided into East and West Divisions) as Cuellar went on to also become the first pitcher in Major League history born anywhere outside of the United States to win a Cy Young . On May 29, 1970 , Mike Cuellar pitched a 9-inning, 4-hit, complete game shutout, at Anaheim Stadium, striking out ten hitters. During the fourth inning, Cuellar struck out Alex Johnson , Ken McMullen , Tommie Reynolds , and Jim Spencer - the first recorded four strikeout inning by a Baltimore Orioles twirler.